A clever concept camera that combines retro instant pictures with even more retro pinhole photography. Each camera comes pre-loaded with two sheets of Fuji Film instant film (probably Instax mini ) and easy to follow pictograms on the back. You pop open the camera, open the shutter flap to make the exposure, and then collapse the camera again. The pencil that’s included is then rubbed along the back in one direction to burst the developing paste on the film. Cut in half and you have two photos, one for you and one to send as a post card to a friend. Very clever! I now have a reason to get a pack of that film and mess around with it. At this point, it really felt like I was seeing things. The drinks weren’t the worst part, it was mostly the restroom. My bladder began to hurt. Later, it would go numb. 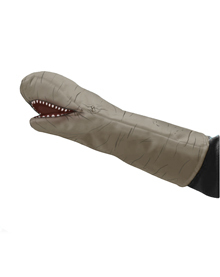 Just the thing for your next BBQ, an oven mitt that that is styled after the space slug that tried to eat the Millenium Falcon in “The Empire Strikes Back“. A bit of trivia, the Millennium Falcon’s design was inspired by a hamburger.